I set off northwards from Bury St Edmunds railway station, and within a few minutes I was leaving the suburban houses behind me, and the traffic hurtling towards Mildenhall. Instead, by the grace of County Council planning policy, I found myself in the thoroughly rural surroundings of Fornham St Martin, the church sitting grandly above the road beside a beautiful old pub. 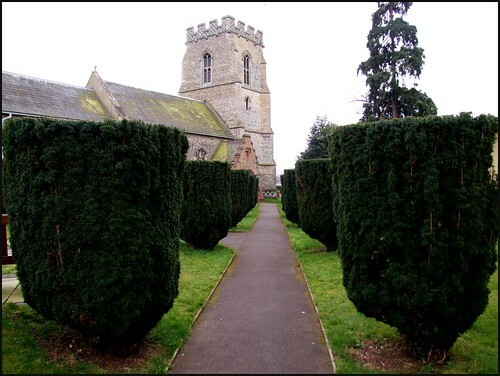 The church sits end on to the road, the north side pointing a delicious late medieval red brick porch towards an avenue of yew trees which lead diagonally towards the village. At the entrance is a huge war memorial, a reminder of the significance of that conflict in the collective memory of the Church of England. There is a pleasing mixture of old and new headstones, and from beyond the graveyard, the shouts of a football match echoed off of the flint walls. I felt a sense that this place still has an importance, the church a significance in the day to day life of the parish. The shape is curious, the plan made square by a huge Victorian south aisle; nothing subtle there. The tower is a grand affair, a result of an extremely large bequest in 1425. So much has always been obvious to the passer-by, but I was looking forward to seeing more. 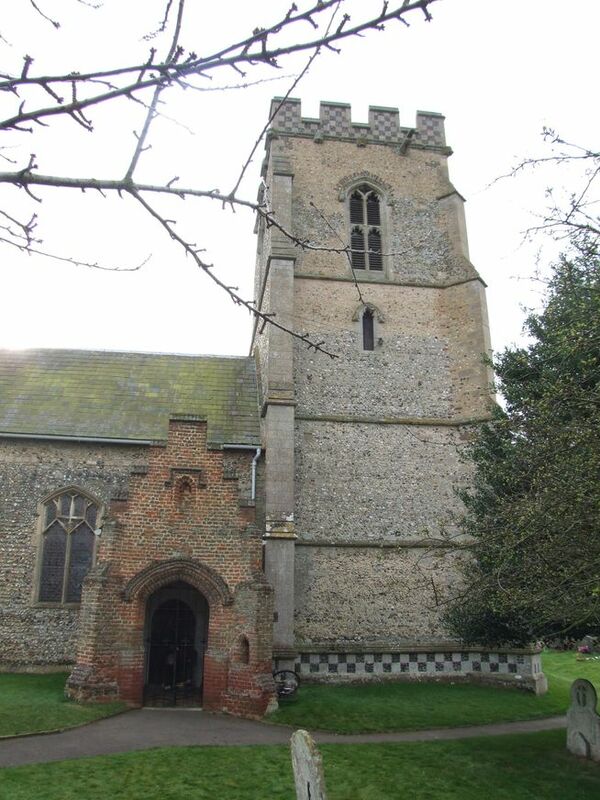 When I had made my first tour through the churches of Suffolk at the end of the 20th Century, St Martin was one of a number in the area to the north of Bury which was kept locked without a keyholder. I had grumbled rather vociferously about this. Rather pleasingly, I was challenged by one of the churchwardens after a talk I gave to the Suffolk Historic Churches Trust. She had put a considerable amount of energy into persuading the PCC that they should be more accessible, and today there is a keyholder. The church is actually open in Summer, which is even better. In 2002, a couple of years after I had been this way, I had found a poignant Easter Communion card on a junk stall at a fete in a north Essex village. 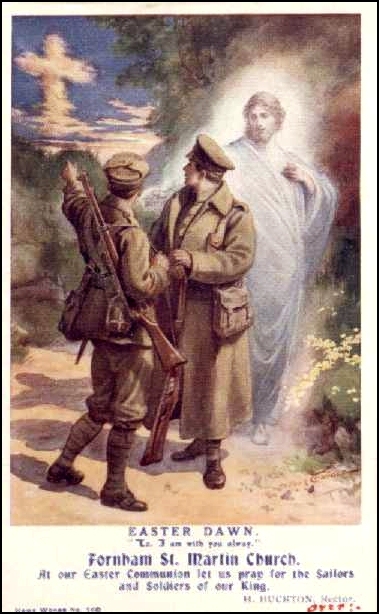 It shows two British Tommies glancing back at clouds which form the shape of a cross, while a rather ghostly Christ looks on. It is dated 1916, a few months before the Battle of the Somme, and the caption reads Easter Dawn, "Lo, I am with you always", Fornham St Martin Church. At our Easter Communion, let us pray for the Sailors and Soldiers of our King. H. Huckton, Rector. As you might imagine, this card was in my mind as I came back to Fornham St Martin. I had kept it as a valuable reminder, not only of the mindset of the Church of England during that grisly conflict, but also of the High Church enthusiasm for pseudo-Catholic paraphernalia: the sentiment was resolutely protestant, and yet there was a devotional quality to it, like the colourful prayer cards handed out at a funeral Mass in some Mediterranean village church. In retrospect, there is a horror to this sentimentalising of the carnage in Flanders, but it needs to be understood as a way in which grief was ministered to and mediated. 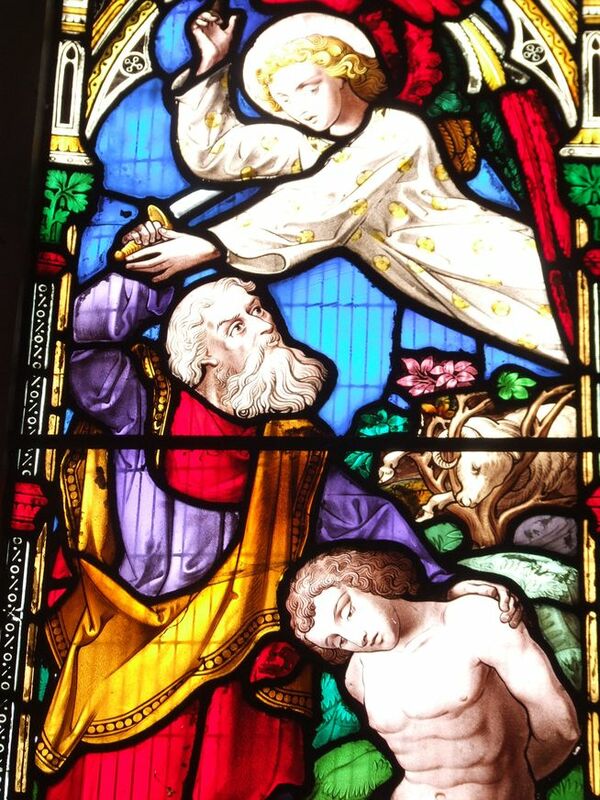 Such imagery is also an important element in understanding how the late 19th and early 20th centuries led to the way that many of our parish churches look today. On this winter morning, I found the porch locked, but I had noticed a car parked at the churchyard gate, and so rather than go and bother the keyholder, I tried the priest door into the chancel. It opened. I stepped inside, to be met by two kind ladies who were preparing the church for Sunday. After a chat, I wandered down to the west end of the nave, where there is a stunning modern window by Abbot & Co, illustrating the Benedicite, the canticle traditionally sung in Anglican churches during Lent (I wonder to what extent this tradition is still observed in the churches of England?). O all ye Works of the Lord, bless ye the Lord : praise him, and magnify him for ever. O ye Angels of the Lord, bless ye the Lord : praise him, and magnify him for ever. The interior of St Martin is rather lighter than you might think from the bulkiness of the exterior, and this is notwithstanding a large range of late 19th and early 20th century glass, much of it excellent. A lot of it appears to be the work of the Clayton & Bell workshop and the Heaton, Butler & Bayne workshop, and the subjects suggest the same High Church enthusiasms as my prayer card: St Genevieve and St Elizabeth, the story of St Martin, and so on. 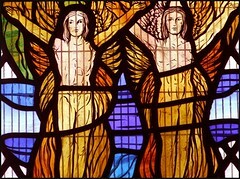 Best of all is the window in the south-east corner depicting the three Marys confronted by an angel at the empty tomb; unfortunately, it is partly obscured by the huge organ. There are a couple of curiosities. Some medieval misericords have been built into the lectern and reading desk. They are as likely to have been bought by an antiquarian as to have come from this church originally, but interestingly one appears to depict St Martin himself. 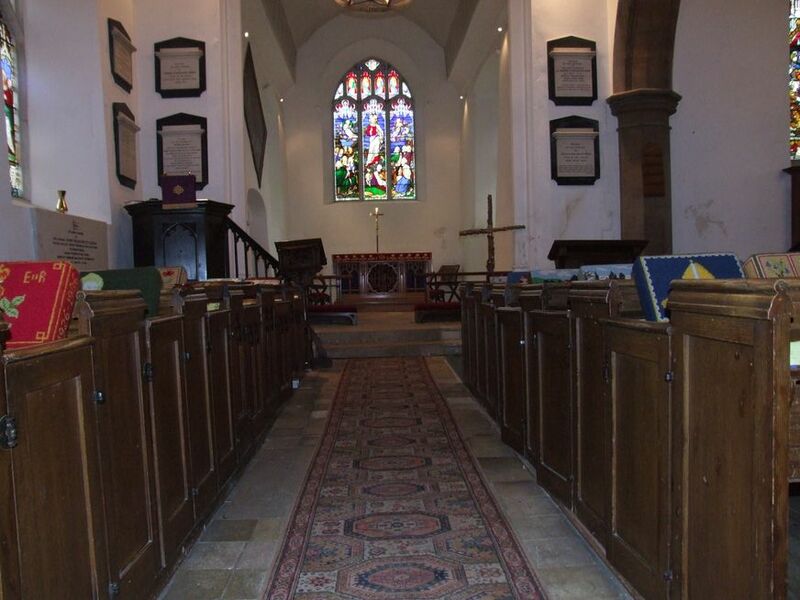 Up in the chancel there is a huge 1840s hatchment depicting the arms of the Duke of Norfolk. There is something similar in the Catholic Cathedral in Sheffield. Back in the nave are two rather sweet memorials. One of them remembers Vice Admiral James William Rivett-Carnac, winner of the Legion D'Honneur and the Croix de Guerre, who was a man greatly loved. Nearby, Henry William Claughton was HM Inspector of Schools in this county for 38 years. When he died in 1924, his memorial was erected to the memory of an unselfish sportsman, by his wife and hunting and cricketing friends.